Archaeologists believe they may have found the remains of Alfred the Great after radiocarbon dating a tell-tale pelvis bone, found in a Victorian pit dig at Winchester’s medieval Hyde Abbey during the 1990s but left in a box at the town’s museum. Excavated during a community dig at the former monastery between 1995 and 1999, the bones had been damaged by antiquarian activity and considered unremarkable. But new research has shown that they are likely to represent a man aged between 26 and 45, buried between 895 and 1017 AD – matching the profile of the 10th century English ruler or his son and successor, Edward. “Given the age at death of the individual, and the probable male identity, the plausible candidates are King Alfred, King Edward the Elder, or the brother of King Edward, Æthelweard,” says Dr Katie Tucker, a Researcher in Human Osteology at the University of Winchester. “All were buried in the Abbey. However, historical evidence indicates that only the coffins of Alfred and Edward were at the site of the High Altar. “The human remains from the Abbey excavations came from a number of locations. “Most were found in the area of the medieval cemetery to the south of the church, so were not of interest to the investigation. “Human bone from a small number of areas, either at the site of the High Altar or in the immediate vicinity, were singled out for further analysis and radiocarbon dating. “The discovery of the bone in a pit dug into the graves in front of the High Altar makes it far more likely that it comes from either Alfred or Edward." Osteological analysis of the pelvis revealed a diet different from other bone fragments found near the altar. Its carbon-rich, nitrogen-depleted state suggests a later, medieval diet rich in marine and freshwater fish. “It is extremely unlikely – much less than a 1% chance – that the true date of the pelvis bone is as late as AD 1110,” says Dr Tucker. The findings are the latest twist in a lengthy search for a King famed for fending off Viking invasions. 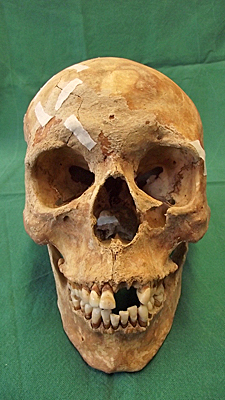 In March 2013, the university’s archaeological team and community group Hyde900 were given permission by Winchester Diocese to exhume the remains of an unmarked grave at Saint Bartholomew’s Church, revealing five skulls from at least six individuals. “Inside were a large number of human bones, arranged with five skulls at the western end, nearest to the church,” says Dr Tucker. “There were then the long bones, and a group of smaller bones at the eastern end, possibly placed in a wooden box, as several nails were found. “One was definitely female, one definitely male, two possible males and two incomplete individuals. “These people had suffered from multiple pathologies, including common conditions such as dental disease and arthritis. “We do not know exactly where the people in the unmarked grave were buried in the Abbey, but the frequency and severity of their medical conditions is unusual and may mean that they were buried separately from the rest of the dead. Crucially, the skeletons dated from between 1100 and 1500 AD, ruling out royal remains. “I would say the feeling among the project team was disappointment, although personally I wasn't that surprised," says Dr Tucker. Rosemary Burns, a Trustee of Hyde900, says the news was “disappointing”. “But we didn’t give up,” she reflects. “As part of Dr Tucker’s research she contacted the Winchester Museum Service to find out more about the community excavation, and that led her to an exciting development. Dr Nick Thorpe, the Head of the Department of Archaeology at the university, says the “plausible link” between the bone and the Kings is “extremely exciting”. “We also believe that we are helping the city to right a historical wrong done to the remains of these great kings, which began with the dissolution of Hyde Abbey in 1539, to be followed by centuries of neglect, destruction and disturbance up to the last antiquarian diggings in 1901,” he suggests. A BBC Two documentary, The Search for Alfred the Great, will tell the team’s story next week. “Alfred was hugely influential across the British Isles, but here in Winchester Alfred’s story is particularly resonant,” says Professor Joy Carter, the Vice-Chancellor of the university. “There have been many attempts to find and identify his final resting place over the last century and beyond, but all have proved inconclusive.